I‚Äôm the “Fast Casual” guy around here. And not just because of the way I dress. I‚Äôve spent the better part of a decade supervising advertising and marketing campaigns for fast casual style restaurant chains. So when something big happens in the restaurant business, fast-casual or no, I‚Äôm all ears. Is it sustainable? 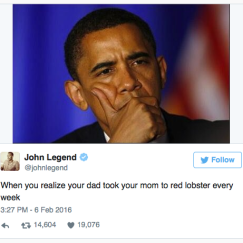 Will it jumpstart Red Lobster into double digit growth over the long term? Will America be forced into rationing Cheddar Bay Biscuits? Not likely. 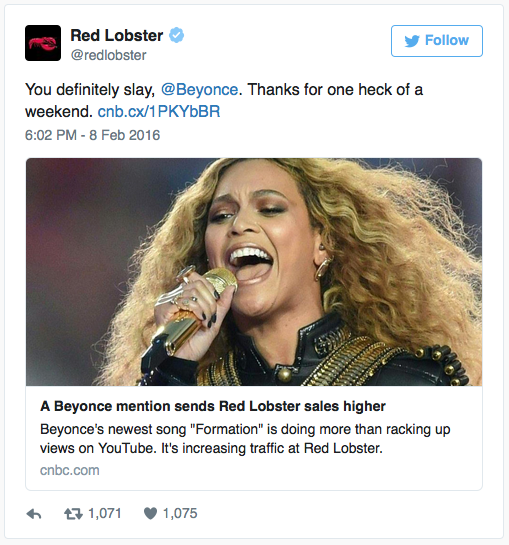 Was Red Lobster thankful for the boost and the exposure? You bet. So seriously, what does this microcosm of a marketing anomaly tell us? Well, for one, the sales spike is the anomaly, not the situation. In an age when the personas of societal influencers‚Äî celebrities, sports stars, even politicians ‚Äîare brought so much closer to us via our accessibility to interactive media and the influencers are their own mini-publishing operations, we see what an incredible impact they can have with content issued in the right context. The advertising industry should take a lesson from this. I won’t belabor the point of how consumers are now EMPOWERED and how it takes more than a good-looking ad to shift movement… but that is the case to a great degree. 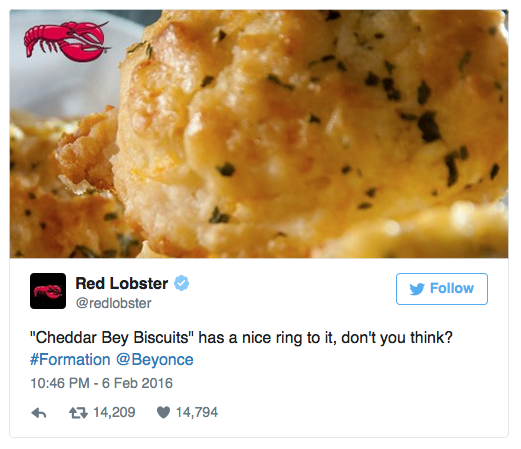 If Red Lobster had paid for six 30-second commercials during the Superbowl (at $6 million a pop, nonetheless), do you think they would have seen anything close to the actual ROI they got from Beyonce spending a total of 7 seconds mentioning the chain? NO WAY. And do you think all the social media amplification would have occurred over screaming through the TV about LobsterFest? Negative. The lesson here – advertisers take note…You just might find yourself becoming part of the pop culture. And that can’t be bad for business. P.P.S. Hold up. Pay attention. PLEASE DON’T DO THIS!!!!!!!! Uhhhhhhhh. Uhhhhhhhhhh. UHHHHHHHHH. (taps Red Lobster on shoulder…) Excuse me. Beyonce puts your brand squarely in the center of the pop culture universe, and the best you can do is HOCK YOUR BISCUITS? You were given a seat at the table of the Illuminati, and THAT was your first reaction??? Sometimes you have the goose that lays the golden egg…. and you take that goose and shoot it in the head and have it for supper. Yes, it fills you up for one meal. BUT NO MORE GOLDEN EGGS!!! This is actually a great instance of a brand NOT reacting with proper content given the context. Why oh why do so many brands knee-jerk to the SELL…SELL…SELL… mentality when presented with an excellent opportunity to build brand equity and street cred? 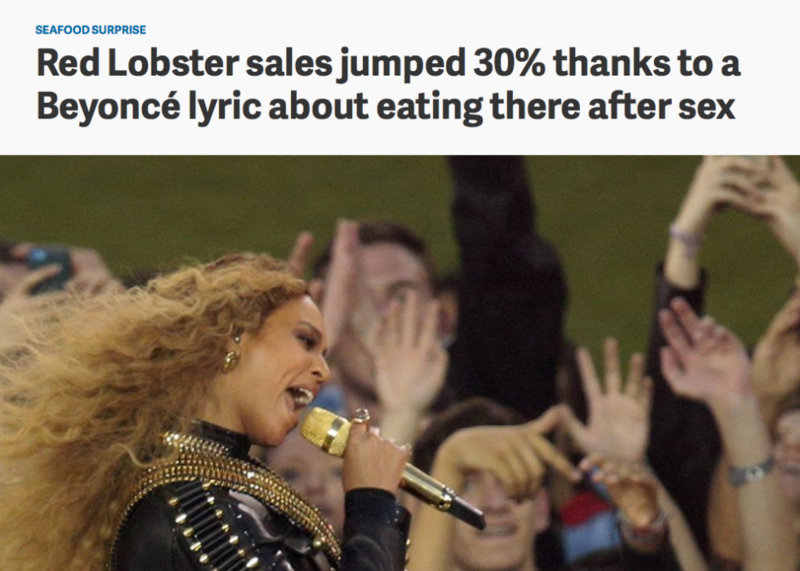 Red Lobster, all we can say is “HONK!” Congratulations on the sales spike.